Kosovo Serb leader, Oliver Ivanovic, has been killed in north Kosovo town of Mitrovica. Follow our coverage for the latest developments as they com in. Kosovo’s Minister of Justice, Abelard Tahiri, said that nothing can justify violence and criminal offences, no matter who is the victim or perpetrator, following the murder of Kosovo Serb leader Oliver Ivanovic. “I have requested from the relevant authorities, in accordance with the legal competences and obligations, to conduct comprehensive investigations into this terrible act, as soon as possible, to shed light on it as soon as possible and the responsible perpetrators receive the deserved punishment according to laws in force in the Republic of Kosovo,” Tahiri’s press statement reads. The autopsy of Oliver Ivanovic’s body has been concluded, with forensics experts finding six small bullets in the Kosovo Serb leader, BIRN has learned. The autopsy took place in Mitrovica, where Ivanovic was gunned down this morning. Tonight’s meeting of Kosovo’s National Security Council will commence in a few minutes. Earlier today, a spokesperson for the Kosovo government told BIRN that it will be a regular meeting, despite this morning’s news of Ivanovic’s murder. 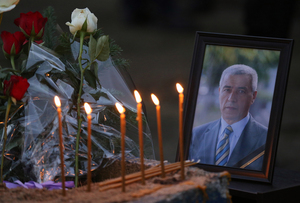 Kosovo citizens have been lighting candles in honour of the late Oliver Ivanovic near where he was shot down today in the northern Kosovo town of Mitrovica. The EU's rule-of-law mission in Kosovo, EULEX, stated this afternoon that it "strongly condemns the act of criminal terror that ended the life of Oliver Ivanovic today." “EULEX Mission and myself personally, express deepest condolences to Mr Ivanovic’s family and friends. I appeal to those who have any information that may lead to the arrest of those responsible for Mr Ivanovic’s murder, to report it to the authorities. I appeal for everyone in the community to remain calm and dignified at this difficult moment,” said Ms Alexandra Papadopoulou, Head of EULEX Mission. “We call upon all international institutions in Kosovo to take comprehensive measures to prevent possible incidents in the province in accordance with the existing mandates. Hundreds of people are gathering in front of Saint Sava temple in Belgrade to pay respect to killed Kosovo Serb leader Oliver Ivanovic. Following a meeting of Kosovo’s National Security Council, Prime Minister Ramush Haradinaj said the murder of Kosovo Serb politician Oliver Ivanovic was a result of illegal interference coming from outside the country. “We think that this crime, but also certain criminal developments taking place in north, are a result of illegal involvement that is happening in the north [and is coming] from other instances outside Kosovo,” Haradinaj said. “If we would need help with the investigation, we could invite FBI,” he added. Belgrade based news agency Beta reports that Oliver Ivanovic would likely be buried in Belgrade on Thursday. 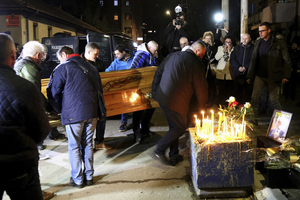 Earlier tonight, Ivanovic’s coffin was brought to his office in the northern, Serb-dominated part of Mitrovica, Kosovo, where people are gathering lighting candles and leaving flowers. “Finding perpetrators and those who gave orders for this killing - as well as their condemnation - is the only way to create circumstances for trust among Kosovo North citizens in a state where rule of law prevails the rule of gangs and terror,” Peci, who is Executive Director of Prishtina- based think tank KIPRED, wrote in Facebook. He added that, for Kosovo authorities, shedding light on Ivanovic’s murder is “not only a duty, but also a necessity” in order for Pristina to ensure a better and safer future for Serb community in Kosovo. Shpend Maxhuni, the head of Kosovo police, said that authorities are gathering information on the burned vehicle used by Ivanovic’s assassins. 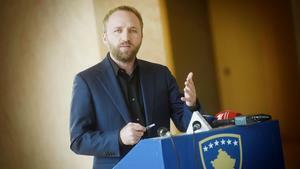 “This car had no register plates, but in a very short time we could have the necessary information about its origin and the ownership [....]I believe that the information we have about the car is sufficient for us to investigate deeper about its owner and its route,” Maxhuni said following the meeting of Kosovo National Security Council on Tuesday evening. 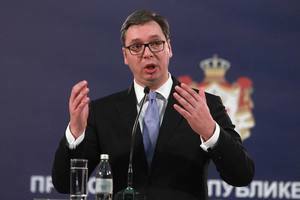 Serbian President Aleksandar Vucic plans to visit Kosovo on Saturday, Marko Djuric, head of the Serbian government's Kosovo office, told Serbian public broadcaster RTS on Tuesday evening. “Our job is to fight to solve [the murder of Kosovo Serb politician Oliver Ivanovic] and Serbia will not just stand until the killer of Oliver Ivanovic is not brought to justice,” Djuric said. “NATO spokeswoman Oana Lungescu said NATO “fully supports the EU-facilitated dialogue between Belgrade and Pristina, and calls for this dialogue to continue as soon as possible. This is critical for regional peace and security,” report writes. Director of the Serbian government’s Office for Kosovo, Marko Djuric, said that the EU-sponsored negotiations with Kosovo in Brussels will be on hold until the killers of Oliver Ivanovic are identified. “The dialogue will not continue until we get the answer who killed Oliver Ivanovic,” Djuric told the Serbian national broadcaster, RTS. That concludes our live coverage of events as they developed on the day of the assassination of Kosovo Serb politician Oliver Ivanovic. Thank you for following us, and expect more coverage of the reactions and investigation on this case on Balkan Insight on Wednesday morning.